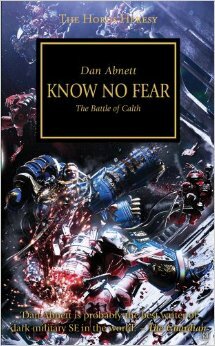 Last night and this morning I read the nineteenth book in the Horus Heresy series, Know No Fear by Dan Abnett. 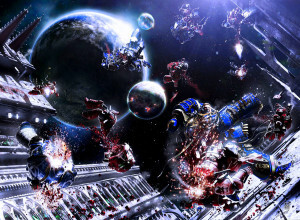 The book records the first Battle of Calth, in which the Word Bearers attack the Ultramarines, the latter’s first intimation of the recently begun Horus Heresy. There are no real spoilers among the thoughts below. I was prompted to pick up this book by the recent limited release of the twenty-sixth novel in the series, Unremembered Empire, also by Abnett. Previously I had only read up through the 4th book of the series. Each of those four is solid to very good, and Unremembered Empires has been getting great comments, so I was intrigued to get back into the series. That said, 40k books are highly variable in quality. Some of the overriding themes and writing are great. Many of the books though are poorly written battle reports of childishly imagined characters. So, despite my love of the setting, I have no interest in reading all twenty-two of the other novels to get completely filled in before Empires comes out in paperback six months from now. Looking to cherrypick the series, I read Know No Fear because it’s by Abnett, one of the stronger 40k writers, and it appeared on a few recommendations of must-read books in the series. I can’t say I was disappointed. It’s definitely among the stronger 40k books and a good, solid read. The battle that occupies probably two-thirds of the novel is well done and moves along, never becoming the sort of tedious recounting better left to action movies from which many of the novels suffer. That said, the battle does occupy two-thirds of the novel, and it’s definitely not the most interesting part. Solid as the book is, it highlights some of the basic self-imposed limitations of the 40k writers. The universe has the depth and breadth to incorporate some really great themes, and the novels often touch on these, but they never quite let go to really explore those. Many, especially Abnett’s, start off with really interesting world and character building, and then devolve into a protracted fight sequence. Know No Fear falls precisely into this fate. That battle stuff is ok and entertaining, but what I really like is the first part of this book. I think the Heresy series has a number of strategic factors driving its immense success. One of these is the large, protracted, epic story arc. It takes a really solid fabric and epic space opera universe to soak up 26 novels, bunches of short stories, and still have basically no end in sight for the inevitable conclusion everyone knows must come. Another is that people enjoy reading history, which all of this is for players of the game. There’s a pleasure to be had in knowing the basic outline but getting filled in on all the details. A perhaps less obvious factor is that the series proceeds from a point in time before the 40k grimdark sets in. At this time humanity is still making progress, there is both a hope and a reasonable expectation of a brighter future, the Imperium is not thoroughly downtrodden and oppressive, and not everything is war. Ultimately people can only read so much misery and darkness before they tire of it. The Heresy books, probably especially ones like this set around the prospering and civilized Ultramar, don’t have that same crushing bleakness to their background. 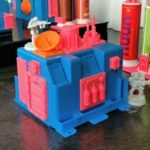 That brightness and engagement with the larger civic enterprise of building the Imperium also brings a lot of variety and texture to the story. 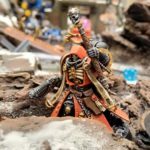 Among the current-timeline 40k novels, it’s no accident that the most popular books and series are based around the Inquisition and the Imperial Guard, like the Eisenhorn and Gaunt’s Ghosts books. Those settings and characters offer a rich world with many different types of people and places. In contrast, despite being the most popular faction in the 40k universe, Space Marines often make boring novels. They kill stuff and hang out on their battle barge, and repeat. They’re also all pretty much conditioned clones of each other, with comparatively limited variances. The Heresy books step around that limitation. The novels feature a lot more world building, characters outside the chapters, and the rebellion itself induces such a large fault line as to create differences among the characters. I actually really enjoyed the “boring” stuff opening Know No Fear, like Space Marine Captain Ventanus and Sgt Selaton zipping about in a Landspeeder, getting stuck in traffic on their way to argue with the local dockworkers, or discussing the Imperial project with Tetrarch Lamiad in a futuristic, optimistic, empty museum. Ventanus isn’t sure what’s going on, but he’s sure he’s not going to like it. The other thing I really like about Know No Fear is that the opening portions really focus on the idea of the Space Marines as trans-human, and what that means. To me this is one of the most interesting themes in 40k, and a major part of my love with the Space Marines. In fact, this book repeatedly and often uses that specific term trans-human, which sticks out for me as a modern, civilized, scientific term. Not that many people in the 21st century world would be familiar with this word, or are thinking about what it means, even though we really are approaching having to deal with such entities. 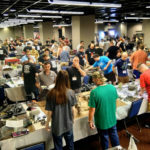 Similar holds for the 40k universe, where the word is rarely used, the Marines are much more frequently cast as super-soldiers, and people are pretty much concerned with not dying, as opposed to what living means. In M30 however, this is a real, high level concept that occupies the more intellectual and world-cognizant of the Marines, this is a world thinking about the future and lofty ideas like what it means to be human. Specifically, the term’s use highlights a key premise at the start of the book, that the Great Crusade is wrapping up, and now humanity needs to figure out how to go from there. 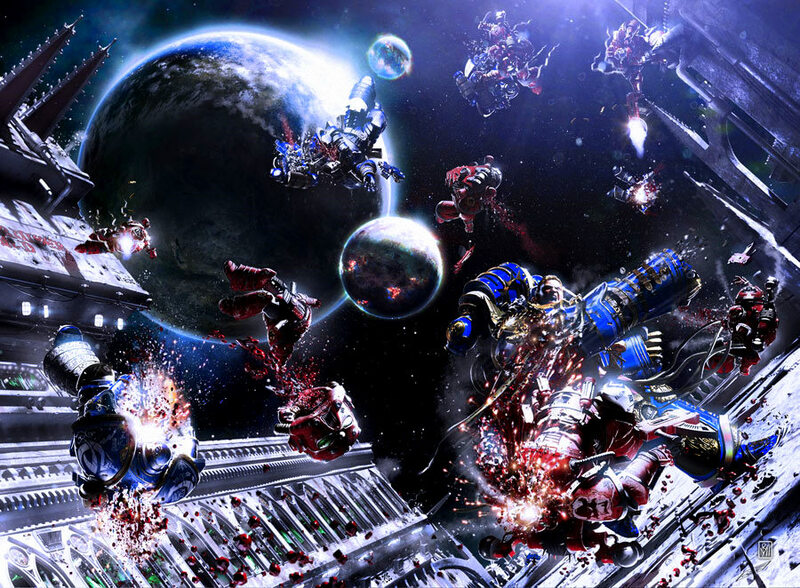 As the Space Marines perhaps most engaged with the world outside combat, many of the Ultramarines in Know No Fear have many discussions in the opening sections beginning to probe their thoughts about their place in a universe consisting of more than war. What does it mean to be a defender of humanity that is not truly human? Further, what happens if such a defender is no longer needed for defense? Ultimately these are the kinds of questions the Heresy as a whole really gets to at its best points. If there are men that truly know no fear, then there are also men that know only fear. To me that is the central driver of the Heresy, those are the traitors. Most simply fear death or pain, though they would never say it, and will make the most unholy bargains to avoid it. Others fear powerlessness, and what could be more powerless than the universe’s greatest warrior in a time that knows no war? Many fear being deemed inadequate by those they venerate most, as is clearly how the Word Bearers feel after their multiple rebukes by the Emperor. Know No Fear gets at many of these points, and it’s the true strength of the book. The opening sections feature not just a literature discussion of those topics, but the ultimate philosopher warriors of the 30th century, the Ultramarines, explicitly discussing them. There’s a lot of talk about their Primarch’s attempts to prepare them to be useful for running governments rather than crusades. In a great, telling display of the Ultramarines as intellectuals all, even the sergeants discuss how comparatively simple, bloody-minded Legions like the Word Bearers and World Eaters will fit into a peaceful age. All of this stuff is great. It’s what made Flight of the Eisenstein my favorite 40k novel, and it was really good to read in this novel. It’s just a shame it’s all mostly dumped for a 200 page battle. A small thing I also really liked about this novel is that it opens with a crazy style, interspersing cold historical record in a very analytical framework of timestamps and notes with Primarch Guilliman’s much more poetical, abstract thoughts. It’s a little tough to follow so I’m glad it phases out after the first chapter or so in favor of a more straightforward style of novel, but it’s really good. Similarly, the internal looks at the Primarch are really enjoyable. A good example is an early sequence of him working on what the reader will recognize as notes for the Codex Astartes, still far in the future, while he also thinks about his chapter masters and how even after all they’ve done they still don’t fully understand his powers. 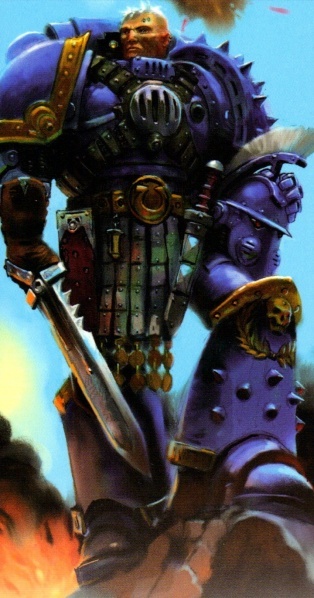 Pretty awesomely and quite appropriately, Guilliman is actually one of the softer voices in the novel, and brings a fair bit of the humanity and even humor. It’s small, but there’s a really nice point of comedic relief where he walks into a sanctum of his, finds an Ultramarine waiting there for a meeting with him that he had forgotten about for hours and hours, has a brief, unrelated discussion with him, and walks back out with the Marine left still waiting for the meeting. 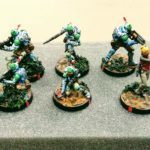 Abnett also does a really good job here of making the Ultramarines stand out with their own unique character. It’s definitely the most appealing I’ve ever found the poster boys of the 41st millenium, and they’ve always appealed to me a little for maintaining Ultramar as the bright point of the stagnant Imperium. The constant scholarly discussions and Socratic teachings among themselves in all the small moments stand them apart, and the constant refrain of “Theoretical?” and “Practical?” in analyzing every problem gives them a voice and tone unique among the Legions. All in all, I’m glad I read Know No Fear, and it meets my expectations of Abnett’s better 40k novels: The inevitable extended battle sequence is good for what it is, but the opening part delivers the goods on world building and exploring the deeper, more interesting themes of the 40k universe. I will say, the Heresy covers are getting harder and harder to tell exactly what the hell is going on.